Cache is a 35mm film pot containing log only.Please bring your own pen or pencil to log. Cache is placed in Nine Barrows Lane looking towards the church. 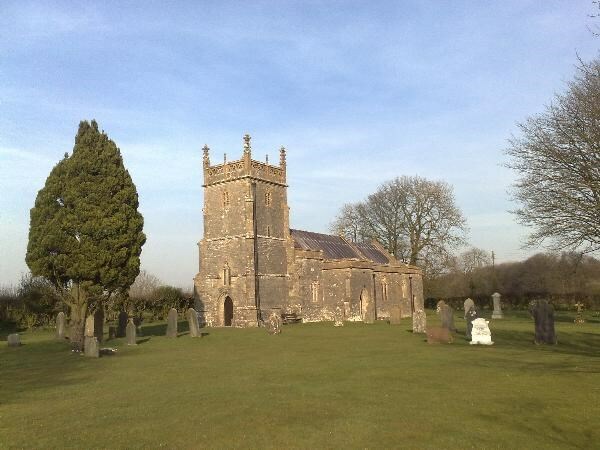 Priddy is the highest village on the Mendips. The church is dedicated to St. Lawrence and was built in the 13th century.The church had some rebuilding done in the 15th century. Between 1881 and 1888 the church was fully restored.The church held three bells up until 1997 when a further two were added. Priddy has been home of the Priddy Sheep Fair since at least 1348 and has been held continuosly since then apart from a couple of years due to Foot and Mouth. The Fair originally was held on the feast of St Lawrence the Martyr on the10th August.It is now held on a Wednesday later in the month. There is absolutely no need to touch any walls. Oruvaq gerr jvgu n ovg bs ubyyl sbe pbzcnal.